Sour cherries are very precious, because their season is rather short and they spoil quickly if not picked in time. But the good thing is that they are perfect for canning and that way can be used as cake filling or fruit compote all year round. I prefer sour cherries for cakes and canning since I think sweet cherries taste a little bland if cooked. 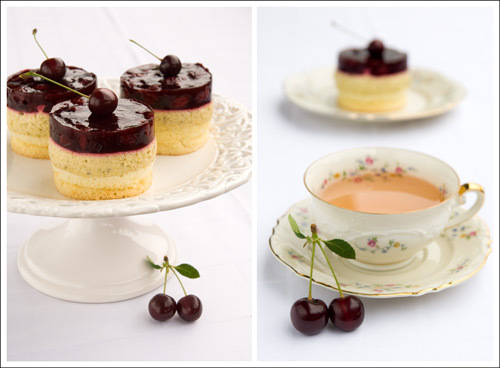 These little cakes I made for you today combine the tartness of sour cherries with a creamy and delicious pistachio mousse, all on top of a light sponge cake. The pistachio mousse is so good that it could be served on its own. I also wanna take this opportunity to congratulate my mother-in-law on her birthday today. Unfortunately she is too far away to try the cakes herself. Happy birthday, 生日快樂 Ann. For the sponge cake beat together the eggs and the sugar in a standmixer on high speed for about 4 minutes until very foamy. Mix together the flour, corn starch and baking powder and slowly fold into the egg mixture. Put 6-8 little cake rings on a baking sheet lined with parchment paper and fill the rings with the dough. Bake for about 15-20 minutes until golden brown. Let cool on a wire rack. Remove the parchment paper on the bottom. Leave the cakes in the cake rings, but lose the rims with a sharp knife. Put the cake rings on a flat plate / baking sheet, which you can fit into your fridge. To make the pistachio mousse, start with soaking the gelatin sheets in cold water. Melt the white chocolate over a water-bath on moderate heat. Using another metal bowl over the water-bath beat together the eggs, sugar and amaretto until thick and creamy. You have to stir the egg mixture constantly, so that it doesn't curdle. Take off the heat and stir in the melted chocolate. Take the gelatin out off the water and also add to the egg mixture. Stir until the gelatin dissolved. Fold in the ground pistachios and put into the fridge. When the mousse starts to firm up, beat the whipping cream until stiff peaks form. Fold the cream into the mousse and equally divide into your cake rings on top of the sponge cake. Put your cakes into the fridge for about 3-4 hours, until the mousse is firm. For the cherry topping soak the gelatin in cold water. Wash and pit the cherries. In a saucepan let the sugar caramelize until it reaches a light brown. Add the orange juice and vanilla extract and let cook at medium heat for about 3 minutes. Add the cherries and cook for another 3 minutes. Take off the heat and add the Kirsch. Then add the gelatin and stir until it dissolved. Let cool until it starts to firm up. 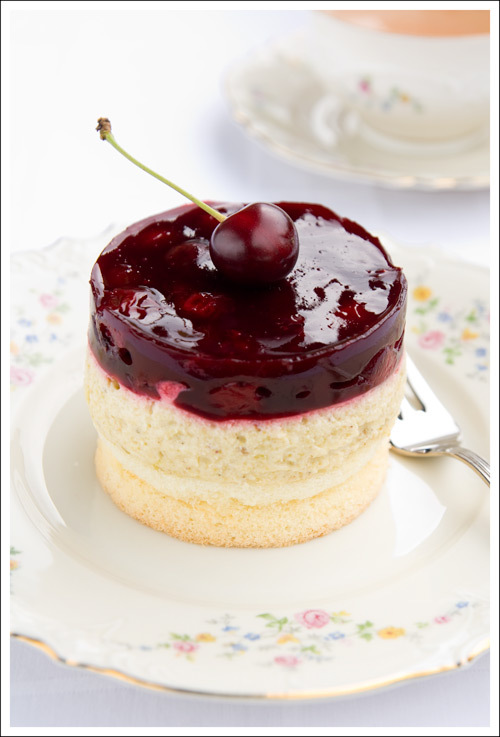 Immediately divide the cherry compote amongst the cake rings on top of the firmed up mousse. Put the cakes in the fridge and let cool for another two hours until the cherry topping is firm. With a sharp long knife cut around the rim and loosen the cakes from the rings.